Dimensions 5.25 by 6.75 by 9.50 in. Economic development; Effect of education on. 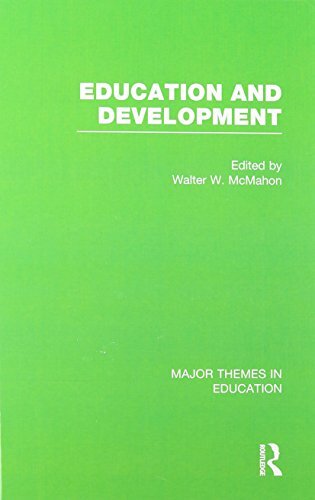 This series addresses the relation of education to knowledge-based growth and broader measures of development beyond growth, central features of the modern world in which education has a central role. This role includes the effects of education on pure economic growth including itÃ¢ÂÂs effects on the creation, adaptation, and dissemination of new ideas. Beyond this, the series presents pivotal research on the contribution of education to the many non-market private and social benefits beyond earnings. These non-market benefits largely define individualsÃ¢ÂÂ life chances and are, for a society, standard indicators of development. Education readers will be able to easily access the most recent and key research defining educationÃ¢ÂÂs role in earnings, in growth, and in the flow of new ideas, all in volume one. The contributions of education to development outcomes beyond earnings, both private and social, are addressed in volume two. The introductions to the series and to each volume place this in a coherent framework. Education dynamics and short and long term Ã¢ÂÂendogenous developmentÃ¢ÂÂ are defined and explored in volume three, and finance and policy in volume four. The views of skeptics about educationÃ¢ÂÂs effects are considered. It is also explained how the controls they use can eliminate educationÃ¢ÂÂs effects through technical change, on broader development beyond GDP, and can focus only on smaller short term education outcomes. Economists in development, growth, and in the economics of education should be especially interested in this series, which is cross listed in economics, because of the new insights into Ã¢ÂÂeducation dynamicsÃ¢ÂÂ in volume three. This includes the short term dynamics of endogenous development involving estimates of difference equations and of five to thrirty-five year education outcomes that build up with time. Volume three also addresses the long run dynamics of optimal growth and optimal development. Other new aspects include the contributions of education to new ideas improving non-market development outcomes and through indirect effects that feed back and enhance growth. This chips away at the mystery of unexplained Ã¢ÂÂtechnical changeÃ¢ÂÂ and also helps explain why static models do not always find education significant to growth, external benefits, or development. For policy, financing criteria need to consider educationÃ¢ÂÂs effects on earnings but also on non-market development outcomes beyond earnings, or overall efficiency and equity. The pivotal articles addressing these important issues are presented in this series together with explanatory transition articles and introductions that put them in a readable and coherent context. About: This series addresses the relation of education to knowledge-based growth and broader measures of development beyond growth, central features of the modern world in which education has a central role.